The South Campus Gateway where Gooeyz opened in August 2010. The restaurant left in November 2013 after numerous problems with Campus Partners and the South Campus Gateway. From sewage leakage to an air conditioning system riddled with problems, a husband-and-wife team with Ohio State ties described its first small business venture in the South Campus Gateway as one in which the best of times became the worst of times. Spouses and Gooeyz co-founders Lanne and Dave Bennett set up shop in the alley of the Gateway plaza in August 2010, welcoming college students to campus with a taste of home in the form of cheesy, greasy comfort food. Lanne Bennett graduated from OSU with a degree in food business management and was a varsity cheerleader, and Dave Bennett also attended OSU. Gooeyz later reopened in a partnership with Woodland’s Backyard at 668 Grandview Ave. However, the announcement of the restaurant’s departure from the South Campus Gateway came less than two weeks after Charlie Bear: Land of Dance, a dance club that was located inside the Gateway’s alley at 1562 N. High St., confirmed it was moving to Olentangy River Road, and about two months before athletic shoe and apparel store Finish Line announced its closing at 1624 N. High St. in the Gateway. All of those announcements were preceded by Kildare’s Irish Pub, which was located at 1576 N. High St., leaving the South Campus Gateway last summer. The Gateway is a subtenant of Campus Partners, which is a private nonprofit corporation that works on community planning in the campus area alongside OSU and the city of Columbus. Lanne Bennett said she couldn’t speak for all of the businesses of the South Campus Gateway, but she attributed the recent business blackout of the alleyway and the surrounding area, as well as the unexplained, sudden departures, to Gateway’s general management being uncooperative with business owners. She said that story is one other Gateway business owners are afraid to recount for fear of the Gateway’s management. “It’s just everyone’s scared, no one will talk. And why shouldn’t they be? I mean, it’s a big ol’ monster coming after you,” Lanne Bennett said. Amanda Hoffsis, president of Campus Partners, gave a statement in an email when asked to comment on Lanne and Dave Bennett’s experience at Gateway. In January 2010, Lanne and Dave Bennett began to inquire about the space at 1554 N. High St., a unit nestled between the Gateway Film Center and the Ohio Art League that was formerly owned by Greek and Mediterranean restaurant The Happy Greek. The South Campus Gateway was 5 years old at that point, and Lanne Bennett said she and her husband were told by the management, which was Columbus Commercial Real Estate of CBRE Group at the time, the space was fairly new, a turnkey restaurant where the two could come in and launch Gooeyz after signing the lease. Dave and Lanne Bennett signed a three-year lease that May, agreeing to take everything “as is” and projecting to open Gooeyz’s doors Aug. 1, 2010. But upon firing up the power and electricity of the space, something Lanne Bennett said they could not do until after signing the lease, problems with the HVAC units’ mechanics became apparent. “We got into this space and there was so much stuff that was broken and didn’t work that they knew about but didn’t tell us about, especially the HVAC units,” Lanne Bennett said. One of the couple’s first service calls to repair one of the two HVAC units revealed the unit was disconnected because it had “catastrophically failed” before Lanne and Dave Bennett took possession. “(Management) knew about (the HVAC unit being disconnected), but they never told us that. So it became our responsibility when we took it over, and (management) said, ‘Well, you’re just going to have to deal with it.’ So we dealt with it,” Lanne Bennett said. The issues with the HVAC in addition to the GFI breaker, which is a device that protects against electrical shock in high-risk areas, such as restrooms and basements, not being installed “up to code” postponed Gooeyz’s opening by nine days to Aug. 10, 2010, Lanne Bennett said. Michigan met OSU at Ohio Stadium Nov. 27, 2010, for The Game, resulting in a crowded campus and a “crazy, busy day” at Gooeyz, Lanne Bennett recalled. 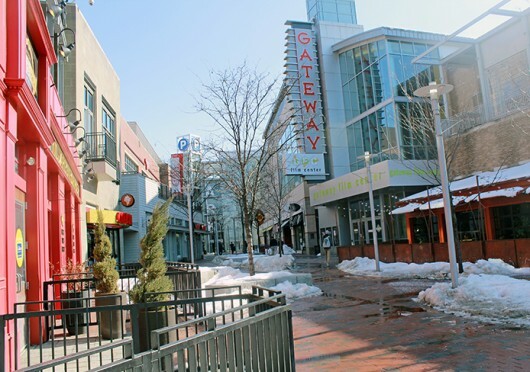 During the game, Dave Bennett said sewage, originating from the Gateway Film Center, spilled on customers — something he said happened nearly 10 times during Gooeyz’s term at the Gateway. Dave Bennett said Gateway’s management addressed and cleaned up any messes caused by the leakage. Lanne Bennett said, however, the problem was a recurring one and resulted in many free, compensated meals to smooth over customers’ experiences. Sitting between campus, where a portion of the university’s roughly 57,400 Columbus campus students are housed in residence halls, and OSU’s off-campus sector, where many of the rest reside, the Gateway’s website states its stretch on High Street sees foot traffic of about 9,000 per day across its 225,000 square feet that run parallel to OSU’s campus. But then, she said, something changed. “Then 2012 rolls around, and, just something, the dynamics — it started in about April of 2012 is when everything really just started changing for whatever reason,” Lanne Bennett said. It was then, she said, traffic began to dissipate. While Gooeyz had been open to serve a breakfast, lunch, dinner and late-night crowd, that weaned into a two-shift restaurant, open only for dinner and late-night meals during weekdays. Since day one of scoping out the South Campus Gateway space, Lanne Bennett said, management promised the business wayfinding signage, and Dave Bennett recalled seeing a set of plans for a “huge sign” on High Street to direct people to the variety of tenants in the Gateway’s alleyway. Other business owners recalled hearing similar promises. Nate DeMars, founder and CEO of Pursuit, a suit store located at 1572 N. High St., said his overall experience with management has been good, but the Gateway had been promising a “special sign” on High Street since before his suit company began its term about two and a half years ago, he said. “A lot of that talk started before we opened, and I know it has kind of stalled and not happened,” DeMars said. Lanne and Dave Bennett gave management additional suggestions on how to advertise the alleyway tenants, Lanne Bennett said, including a sign along a wall facing Ninth Avenue and High Street, a building the South Campus Gateway owns that currently houses OSU’s Technology Commercialization Office, and buying space on a billboard along State Route 315. The ideas for advertising have yet to come to fruition, she said. “You know, the fact that, here it is, four years later and there is no signage on High Street yet for any of those alley tenants is baffling to me,” Lanne Bennett said. In July 2013, Gooeyz was nearing the end of its lease and the HVAC system was still proving problematic. New management, Colliers International in partnership with South Campus Gateway LLC, had taken over the South Campus Gateway, and Lanne Bennett said she and Dave approached its representatives, saying they would consider keeping Gooeyz in the space if management assisted them in fixing the units. Upon request, management claimed it did not have a record of past service calls for the HVAC units before Gooeyz moved in, Dave Bennett said. So after a bit of digging, Dave Bennett approached management with a paper trail of service calls for Gooeyz’s HVAC system, he said. “All of the invoices, I started getting all of the work orders from different heating and cooling contractors around Columbus to put a paper trail of equipment failure, equipment failure, equipment failure, over and over,” Dave Bennett said. Dave and Lanne Bennett presented their findings to the new management to review. “And (management) said, ‘We’re new management, we’re going by the lease, and it says you are required to maintain it,’” Lanne Bennett said. To fix the HVAC system, Lanne Bennett said management quoted $60,000 for full replacement of all units on top of air conditioning, which would come out of Gooeyz’s pockets. The cost to repair the HVAC system, along with the other listed factors which affected Gooeyz’s operations, persuaded Lanne and Dave Bennett to cease business in the South Campus Gateway. Through the end of Gooeyz’s lease, Lanne and Dave Bennett had 90 days to move out of the space. Gooeyz was open for 60 days, Lanne Bennett said, and Nov. 3, Gooeyz’s stopped operating to take the remaining 30 days to pack up. Management charged Lanne and Dave Bennett $100 per day for failure to operate during the move-out period, Lanne Bennett said. “So we were open for 60 (days), and we took 30 days to shut everything down, to shut our business down, to shut our life down, and now they are trying to charge us $2,900 for not being open,” Lanne Bennett said. Additionally, in January, management charged Lanne and Dave Bennett $17,845 for “failure to maintain” the HVAC system. However, Lanne and Dave Bennett received a quote of about $9,000, Lanne said, when they used their own management-approved contractor to assess the HVAC damages. Disagreement with management, however, would cost Dave and Lanne Bennett. “If we choose to have any actions or disagree with them, we have to pay their attorney costs,” Lanne Bennett said. After requests to discuss the charges via phone with management were unanswered, Lanne Bennett said she and her husband were sent a letter from attorneys March 5, saying they were hired by South Campus Gateway to pursue legal action against Lanne and Dave Bennett as well as Gooeyz Grilled Cheese LLC. “They are basically suing us and … I’m going to fight it,” Lanne Bennett said. Dave Bennett, though, said the legal fight is like a match between David and Goliath. “How do you go up against that?” Dave Bennett said. The South Campus Gateway still has multiple vacant storefronts, which Ted Lawson, owner of Charlie Bear: Land of Dance, said speaks to the management. “You could probably just look at that facility right there and the vacancies that are there and probably make your own conclusion on how management is there,” Lawson said Sunday. Lanne Bennett said her experience with the Gateway was something no one should have to go through. “You don’t put your life savings into something for it not to work,” she said. “They (South Campus Gateway management) are affecting our lives. This is personal to us, this is everything to us. Great article. I’m glad someone finally got to the bottom of the management issues at the Gateway and the sudden departure of so many businesses there! Yes, finally the true story is out. Thank you for this article. I love supporting local businesses and I will make a special trip to Gooeyz just to help them fight the good fight. I wish them the best of luck and I will continue to be a loyal fan and customer! Great article! Was a huge fan of Gooeyz, and I’m glad I now know the reason why they closed. I have been making trips out to Grandview’s Woodland’s Backyard for their music trivia nights and was pleasantly surprised when I realized they were serving Gooeyz! Well researched, well-written piece, thank you. Commenting at a remove — Donegal, Ireland — Lanne Bennett and Dave Bennett appear to have been ill-treated. On this reading the Management side acted irresponsibly and in bad faith a-priori. The new management, since they are accepting previous agreed-to contract, will probably also be liable for previous lessor Company’s bad faith; prior to leasing the lessor is obligated to state the real condition of the premises, I believe. Lanne Bennet and Dave Bennett appear to me to have a strong case, besides, they are operating a going concern and successful marketable product. Over 20 years later and campus partners are still ruining businesses. When will it end? Very nice article! Good luck Gooeyz! Could someone please alert the Columbus CDC about this issue at Gateway….it sounds gross and unhealthy!